This weekend the British superbike men are in action at Oulton Park and after the last round at Cadwell, the locals have some work to do. Carrick’s Alastair Seeley has ground to make up on the Tyco BMW in the 1000cc superstock class to close the gap on series leader Josh Elliot and in the supersport class. Glenn Irwin on the Gearlink Kawasaki will be hoping to put the troubles from Cadwell behind him and get his championship back on track as will Jordanstown’s Andy Reid on the TTC Yamaha. 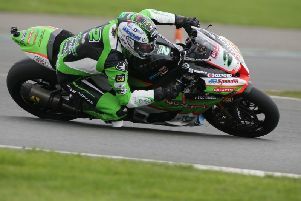 Likewise, Andrew Irwin had his own problems in the superstock 600 class on the MWR Kawasaki at Cadwell and will be looking to get back on the podium. Last weekend Over 70,000 race fans packed into the Silverstone circuit for the Octo British Grand Prix. Sunday’s constant rain didn’t dampen the spirits of the enthusiastic crowd as they cheered Valentino Rossi to victory in the feature MotoGP race. “I‘m very happy and proud of this victory, it‘s a great feeling! I think that the last race on the wet that I won was ten years ago,” he said. “I had great confidence with the bike and it‘s a fantastic victory at Silverstone, where I never won before, this is the first time,” he added. Northern Ireland’s Eugene Laverty finished just outside the points in 17th place. “We had a little experience with this bike in the wet but my feeling on those occasions wasn’t too good,” he commented. Fans also marvelled at British star Danny Kent’s victory in the Moto3 race. In the Moto2 race, pole-setter Sam Lowes made a terrible start lying eighth at the beginning, only to finish sixth by the behind winner Johann Zarco.